If you experience recurring back pain or neck pain, spinal decompression chiropractic treatment could be a solution. Spinal decompression relieves pressure in the spine by using physical manipulation and spinal positioning. This treatment is an effective alternative to more invasive spinal surgeries and regular chiropractic adjustments. Problems like chronically compressed discs can lead to some major issues down the road, like herniated discs that press onto nerves. Additionally, the compression and tight feeling that you feel in your spine is real and can result in your discs becoming increasingly brittle. Without the proper chiropractic treatment, these problems are often worsened due to the restricted flow of nutrients back into the compressed disc. These nutrients are vital for overall spine heal and are needed in order to heal and lessen your back pain. At our Total Chiropractic Care and Wellness office in Medford, we can treat your back by producing a negative pressure around and in your spinal discs. Replenish deficient fluids, nutrients, and oxygen to the injured area. During spinal decompression treatment, you will be strapped onto the decompression table, which will enable it to move as it produces a distraction force onto the specific area of your spine. A computer program will control the level of distraction force that is applied, which will be given between intervals of relaxation. This method will gently pull your spine apart, to help it elongate, and will create a tiny vacuum in between the different vertebrae to help pull the affected disc back into place. Each treatment lasts 30-45 minutes. This type of treatment is not like old-fashioned traction tables, which stretched the entire length or section of your spine. Instead, innovative technologies used in spinal decompression enables chiropractors to produce a much more precise and accurate treatment, targeting the exact area of injury or degeneration. This means that if your whole body becomes tense and your muscles begin to spasm, the decompression table will arrange and adapt itself to your muscles, helping them to release slowly and move them toward a gentle distraction. This type of self-adjusting decompression treatment will enable you to experience the maximum results possible and will ensure that your overworked muscles do not get in the way of your progress. Decompression for back relief works in very tiny increments. Over a period of time, the effectiveness will add up and reshape the affected disc, while promoting healing and allowing the proper flow of fluids and nutrients into the spine. Total Chiropractic Care’s Medford chiropractor, Dr. Goldman, is happy to offer these FAQs to answer some of your basic questions about spinal decompression. While traditional chiropractic treatment has proven effective, some patients with more serious spinal problems require added pain relief. Our Medford spinal decompression services can provide the extra treatment that your vertebrae may need to heal. Spinal decompression therapy is a type of modern traction therapy designed to relieve spine-related pain. Our Medford chiropractor uses spinal decompression therapy to provide a non-invasive, comfortable alternative to traditional spinal surgery procedures. Spinal decompression therapy also provides relief to patients suffering from discomfort due to past ineffective surgical procedures. How does Medford spinal decompression therapy work? Using our decompression table, Dr. Goldman will create negative pressure along specific areas of your spine. A sensor and computer read your muscle tension and the position of your spine, cycling through what are called distraction and relaxation phases to create negative pressure (a vacuum effect) within the discs along with a particular portion of the spine. What does spinal decompression therapy do? By creating negative pressure or a vacuum inside the discs of the spine, spinal decompression therapy pulls any spinal matter which has herniated or protruded beyond the disc back into place. The vacuum effect also circulates blood and nutrients through the injured disc, promoting natural healing and pain relief by reducing inflammation. Designed to reposition and heal spinal discs, decompression therapy can benefit anyone who suffers back or neck pain as the result of an injured disc. 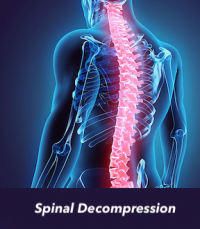 Specific conditions which can be relieved by spinal decompression therapy include slipped discs, herniated discs, bulged discs, ruptured discs, disc tears, disc prolapses, disc degeneration, degenerative disc disease, facet syndrome, spinal stenosis, and sciatica. Spinal decompression therapy has been shown to provide relief from these disorders and promote healing. How many decompression sessions will I need? Everybody reacts to disease, injury, and spinal decompression therapy differently. For this reason, it is difficult to predict the exact number of sessions any person will need before achieving optimal wellness. Each spinal decompression therapy session brings small amounts of relief and healing to patients. Our Medford chiropractor works with each patient to develop a wellness plan and therapy treatment schedule to fit individual lifestyles and conditions. Is spinal decompression therapy safe for everyone? Spinal decompression therapy is not recommended for some conditions. If you are pregnant, over 70 years of age, have severe osteoporosis, severe nerve damage, or severe obesity, spinal decompression therapy might not be the right option for you. It is also not recommended for patients with surgically implanted screws or metal plates. Dr. Goldman will assess each patient’s conditions individually, and recommend the best possible wellness plan. Could spinal decompression therapy help me? If you think you might benefit from spinal decompression treatment on Long Island, contact Total Chiropractic Care and Wellness in Medford, New York to schedule an appointment. Please either fill out our contact form, use the appointment scheduler at the bottom of this page or give us a call at (631) 447-2299.